" Authentic Cooking in a traditional Balinese Village "
​All classes are conducted in English by Balinese chefs fully conversant with Balinese cuisine and culture. and in a relaxed, friendly atmosphere in our beautiful kitchen-garden. Locally grown and sourced ingredients. Experience authentic coconut-oil processing plus learn to make a simple offering. Discover Balinese family life by exploring traditional village at Ubud, chatting with local farmers and residents or by touring our temple. Recipes and notes supplied for you to keep. ​Your choice of meat or vegetarian dishes. ​The Balinese Cooking Class that we offer are completely hands on and conducted in English, students will be provided their own cooking station and utensils to prepare and cook all of dishes by themselves. The class is limited to a maximum of ten participants per class to ensure individual attention for everyone. 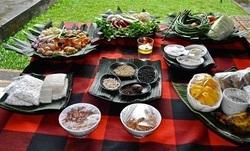 The teacher and his assistant with an extensive knowledge of Balinese ingredients and cooking methods will demonstrate how to cook all of dishes and let the students taste what they had prepared for lunch or dinner and also take away pack if you cannot finish it. The class ( morning session ) starts with a trip to a local market. In Bali Markets open early, The food markets are a great way to introduce students to Bali culture and lifestyle. ​The Chef will explain about Balinese tastes and customs, local meat, fish, and produce, finding unique ingredients and, of course Balinese-style bargaining! Learn the secrets of buying fresh ingredients in a traditional, – what to select and what to reject. Touring a traditional outdoor market provides insight both into how Balinese people approach cooking and how ​​many spend their day. These lessons are as important as those in the kitchen. The centrepiece of the kitchen generally a spartan, functional room is the wood fired stove topped by a blackened clay pot used to steam rice and leaf-wrapped food. In many modern households, this is joined by a gas cooker for boiling water and frying. Both stoves receive daily offerings of a few grains of rice, a flower and salt a gift to Brahma, the animistic god of fire. Despite the complex blending of spices and frag- rant roots that gives Balinese food its intriguingly different flavour, the typical Balinese kitchen is remarkably simple. After the rice has been well washed and soaked, it is partially boiled, then set in a woven steaming basket (kukusan) over a clay pot filled with boiling water. The conical kukusan is covered with a clay lid and the rice left to steam. Every so often, boiling water is scooped out of the clay pot and poured over the rice to keep it moist and prevent the grains from sticking together. Although all utensils were once made of clay, most cooks now use metal for cooking. Many people in the major towns also use electric rice cookers, but most agree that the traditional method for cooking rice is superior. Bamboo is often used in the Balinese kitchen. A split length of bamboo plaited so that it fans out is used as a scoop for lifting out and draining fried food, while bamboo handles with small coconut shells on the end make scoops or ladles. A narrow bamboo tube is used to direct a puff of air into the fire, acting as a bellows. Every Balinese kitchen has its coconut scraper, either a wooden board set with rows of sharp metal spikes or a sheet of thin alumunium with spikes punched out. Grated coconut is mixed into many dishes, or squeezed with water to make coconut milk. The Balinese mortar is shallow and the stone pestle has a handle carved at right angles to the head so that the action is one of grinding rather than pounding. Another essential item is the saucer like stone mortar (batu base) used for grinding dry spices, chillies, shallots and other seasonings. The chopping block used in the preparation of almost every meal is usually a cross section slice of a tree trunk, the wood strong enough to take the repeated blows of a sharp cleaver used to mince meat or fish to a paste, and for chopping and slicing various roots and vegetables. It also doubles as an eating area or a spare bed. Practicality is the theme of any Balinese kitchen. The furniture in a Balinese kitchen is minimal; apart from the stove, a bench and a food cupboard, where the cooked food is stored during the day, there's usually a wide, low bamboo platform, used for sitting on while preparing foods. ​Learn more about Balinese spices and have a great opportunity to cook authentic Balinese cuisine and taste delicious meals. Sate Languan : is made of sea fish, green coconut, spices, and brown sugar. 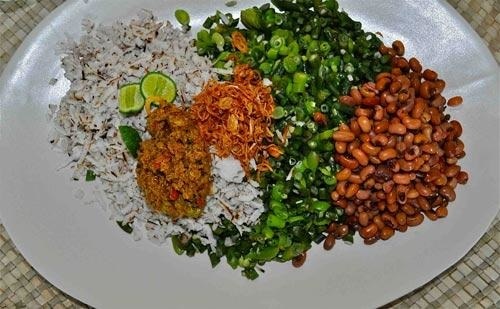 It is a traditional food of Klungkung regency, but it can be found in all over Bali. Sate Languan is served in Balinese ritual ceremonies. It is better served right after grilled (while it is still hot). It can last for only one day. Sate Lembat ( Lembat Satay ) : is made of crushed meat mixed with grated coconut and spices. The meat is usually pork, chicken, duck, and turtle. 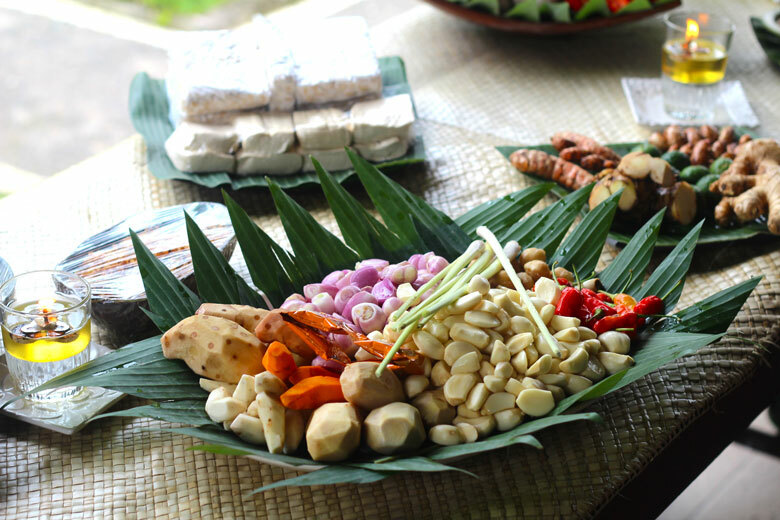 Served in Balinese ritual and traditional ceremonies. 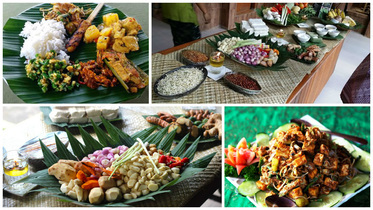 It is also available in many Balinese restaurants, along with Urutan, Babi Guling, ​and Lawar. Balinese Soup : This soup recipe is a specialty soup dish from Bali, Indonesia. This is a very light and hearty soup. Addition of lemon, garlic, coconut milk and other spices make this soup flavorful and will definitely awake your taste bud. During winter, this warm soup will be more enjoyable. Meat lovers can add minced meat pieces to get the meaty touch to the soup. If you are late, then unfortunately you will have to miss the market tour and we will do all possible to pick you up afterwards and before the class commences.